The practice exam has 52 questions, just like the official exam. The type of questions and the number of questions per category is also the same as in the official exam. 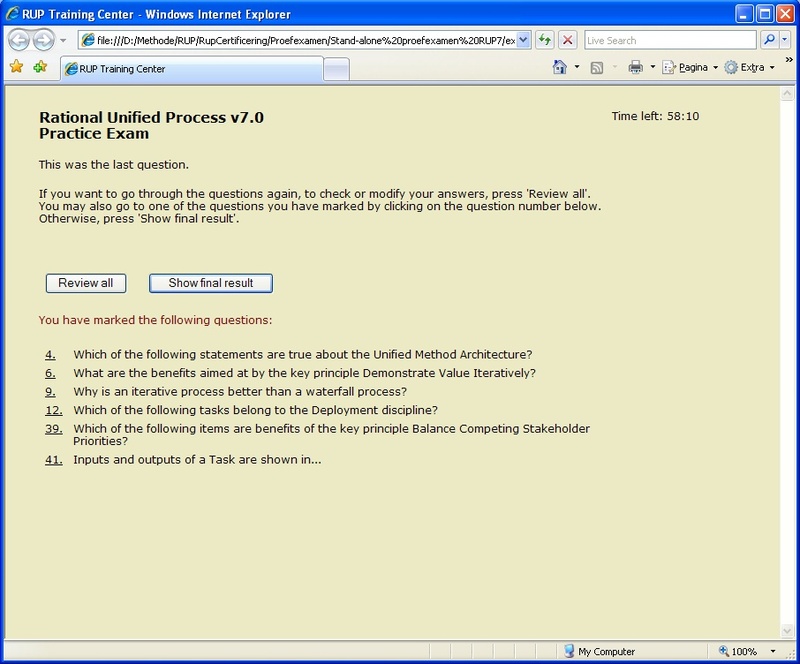 During the practice exam, you may (if you wish) view not only the answers, but also explanations of these answers, with a reference to the RUP 7 web site (a part of IBM's Rational Method Composer), where the answer can be found. 1. This screen shot shows the first question. The time is shown in the top right corner. It counts down from 75 minutes to zero. In this practice exam, you may continue after the deadline. The 'Show answer' button is useful to be able to see the answer while you are learning. You have the opportunity to disable this button before you begin. IBM's official test does not have this button, of course. Using the checkbox 'Mark for review', you can mark questions that you want to review later on. This functionality is also available in the official test. If you have comments about a question or answer, please fill in the text box at the bottom of the screen. After you have finished the test, you can edit all your comments before they are submitted to me. Note however, that if you do not finish the test, your comments will be lost. 2. This is an example of a question where you have to select more than one answer. The test tells you how many answers you must select. The official test does the same. 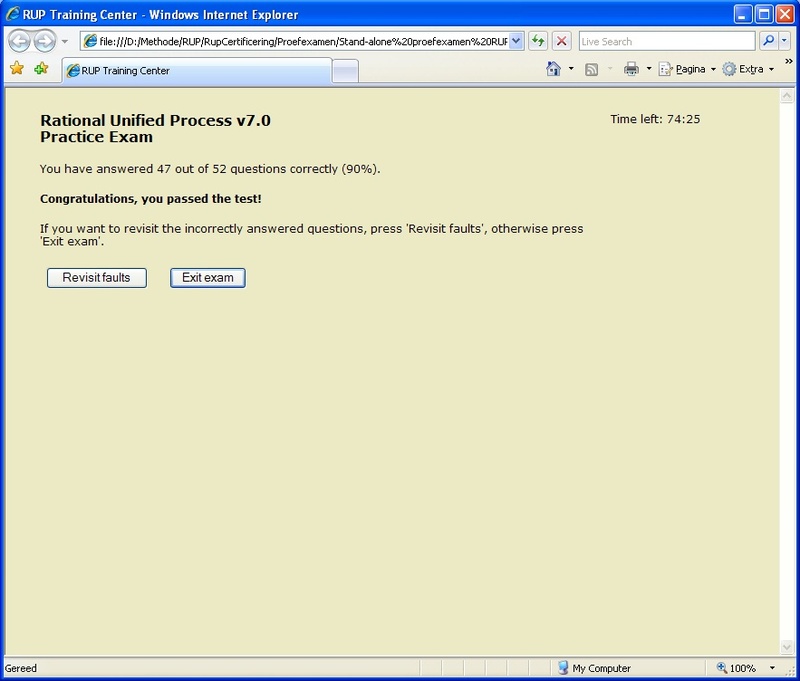 This screen shot was taken after the user pressed 'Show answer', which disabled the check boxes. Note the short explanation and the reference to the RUP web site. The reference says that you should select tab page "Getting Started", then select Method Architecture Fundamentals, and then Key Capabilities of the UMA. 3. This is what you see after you have clicked on the hyperlink 'Show marked questions'. 4. After you have answered the last question, you may review all questions or go to specific questions that you have marked. 5. At the end, the test calculates the score and checks if you have more than 62% correct. The button 'Revisit faults' leads you to all the questions you have answered incorrectly. Rational Unified Process is a registered trade mark of IBM Corp.